Kite Spots on West Coast in October? First - get yourself a subscription to Ikitesurf. It has all the info you'll need. Going on a kite trip and depending on local weather forecast or NOAA or your Iphone won't cut it. 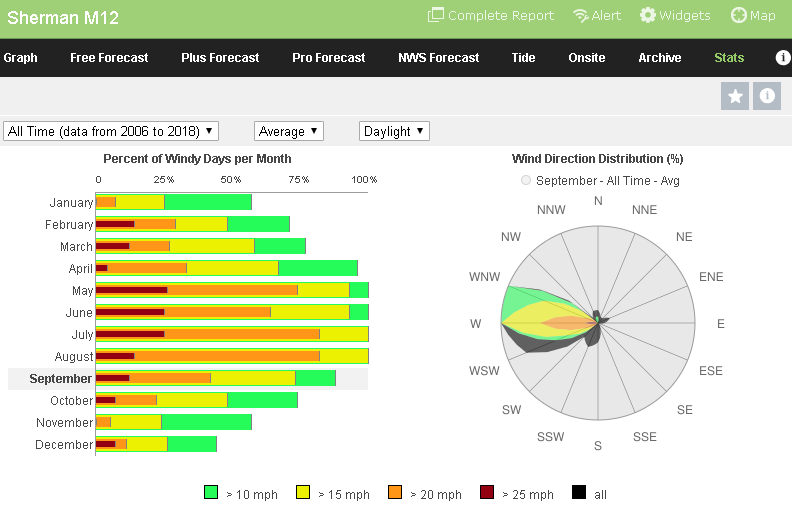 You need forecasts with local knowledge and access to current wind speeds to help you decide where to go on any given day. The west coast kite season (summer) has 2 components that generate wind. High pressure over the coastline and warm air in the interior. This sets up North winds along the coastline of Oregon and west winds in the interior (gorge, sherman island, bay area). Chances for wind on any given day are 75% and greater. These conditions fade away in September and by October your chances for wind are less than 50%. Quite often the wind will be from the opposite direction - south winds on the coast and east winds in the gorge. Sorry to say but October is hit or miss on the west coast. Best bet in North America would be San Padre (75%) in Texas or Cape Hatteras (75%). If you're interested in something else like mountain biking or fishing for steelhead - go to Oregon. 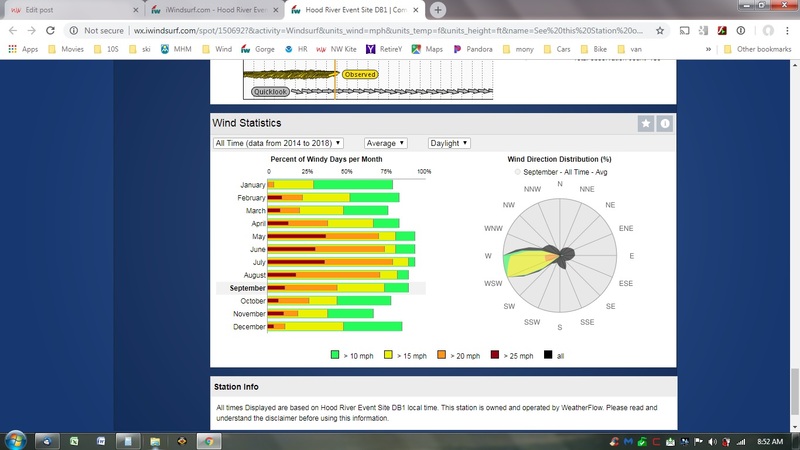 Use Google to search for wind stats at any beach - there's great data out there. 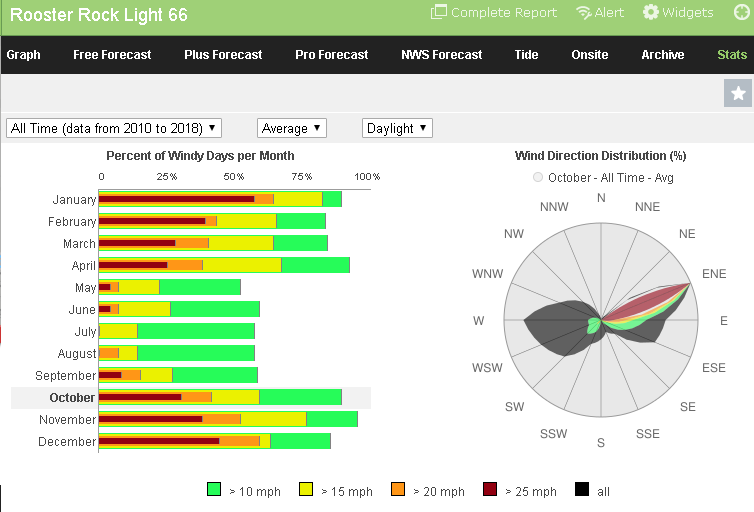 October on the west coast is pretty spotty for strong kiting winds. The beginning of the month can still have a few days on central Oregon coast, but by the end of the month it is pretty well finished at least for north winds. Winter time storm winds are taking over as the main course for kiting till things turn around again in late winter to early spring where north winds begin to start up for a new season. Winter storm kiting is definitely not for everyone as it can best be describes as brutal and unforgiving. Central and southern California can still deliver some great days of kiting along the coast into November and even December, but it is not nearly as consistent as the February to September core of their kiting season. Best advice would be to bring a traditional surfboard for windless days, a mountain bike and hiking boots and you will find plenty of great adventure with those rec tools. If you are willing to drive beyond the US border, northern Baja can be outstanding for reliable wind at places like PSC and other locales in that area. If you want to stay west coast and stay in the USA personally I'd just barrel down to SoCal for October. Stop and kite at Crissy and Wadell if there is wind on your way through. Then just chill out between Jamala Beach and San Diego. Take a surfboard or wait until you get down there and buy a wavestorm at costco. You'll probably surf more than kite but there will still be lots of opportunities to kite. If you want better kiting then bite the bullet and take the 4 day drive to South Padre Island in Texas. Rooster Rock easterlies are probably one of your better options. As LDHR stated. IKITESURF.com is an excellent tool for planning a vacation. How's Sherman island towards the end of September for foiling wind ? If you subscribe to IKITESURF.com you can access stats like these (actual screenshot from windalert.com website but same account provides access to both).